The typical man with a full-time job–the one at the statistical middle of the middle–earned $50,383 last year, the Census Bureau reported this week. As I often do when confronted with puzzles like this, I contacted Larry Katz, the Harvard University labor economist. 3. 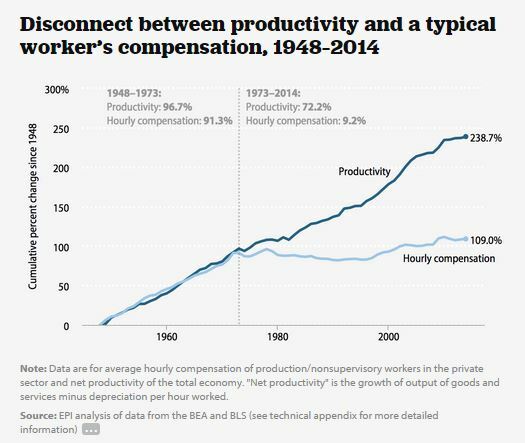 The “most important factor,” Mr. Katz says, is the rise in wage inequality, the gap between the earnings of the best-paid workers and the ones at the middle and the bottom that has been widening steadily since about 1980. Economists differ over how much of this is the result of globalization, technological change, changing social mores, and government policies, but there is no longer much dispute about the fact that inequality is increasing. It’s easy for Republicans to blame wage stagnation on Democrats and vice-versa. It’s not hard to understand why so many voters (who don’t need Census Bureau tables to understand what’s happening to their paychecks) are drawn to candidates who acknowledge this reality, lambast incumbents for not doing more to address it, and style themselves as outsiders with fresh approaches to one of the nation’s most alarming economic problems.